I could not happen upon this sign at a more poignant time. Though I travel the subway several times a day I had not ever observed it before. That is not to say that they have not been posted, just it had not caught my attention. On the Thursday evening, 20 April 2006, and just moments after I had written 'Depression vs Oppression' in my note pad, as a result of a promo that I had heard yesterday morning during morning news and in response to several people who had followed me to the subway from eating at Old Siam. In particular a woman of mixed race, a white woman and and white man in a cowboy hat through hand gestures and body languages would police, oversee and follow me on the platform at Eastern Market. Moments before I had dined at Old Siam and whe nI would take pictures and jot down notes at the restaurant similar behaviors and reactions by others would occur as they had the night before when I dined at the Italian Kitchen, on 17th Street. Depression vs Oppression. There are many contributing factors for these behaviors and reactions from and by others toward me. None which anything to do with depression nor my mental health, and every thing to do racsim. So, if I were to turn around and confront these individuals, as I often, they and others would ignore the fact that my reaction to them is quite normal. But their behaviors and actions are not. There are many factors contributing to these scenarios. Most of which are connected to racsim. Some years back, in 1992 or so, I'd author a power poem entitled "Depression vs Oppression" that spoke to the fact the meticak community, society, law enforcement, folks in general, have a nasty little of misdiagnosing and misrepresenbting about black men. And as a result but all to their benefit the infrastructure and psyhe in America is create disorders, lies and industries based on the negation of black men. And, as a result, much of what you read about, like much what is diagnosed for and spoken about black men are deliberate attempts to feed this racism. 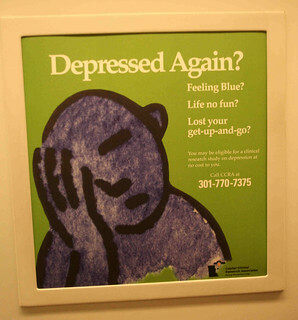 On Thursday morning, while working on the computer I heard a promo pertaining a later report suggesting that blacks and minorties do not receive the same care for depression and further more, that blacks and minorities are more likely to be misdiagnosed and/or mismedicated for depression. Reflecting on a series of poems from Blackout Anthology that spoke on these issues pertaining to the fact that as a black male I have misdignosed, mistreated and misrepresented in every possibve way and though the truth was plain to see what had begun the mission of all was to misdiagnose and discriminate. My photography shows charcter and defiance. Power, and absolute confidence not only my photogaraphy but in myself. And without, my writings exposes the unspoken truths. My approach to me on the subway, in catering, on trains anywhere that I ever is defiance of thbe racsim that has herald down upon. And when I take pictures or go to work in catering or travel white friends, it the mission of these people to run around behind and discriminate, lie and misrepresent the truth. I would telephone Richard and remind him, that once again the media and medical communities are perpetrating lies about black men. I would remind him of my experiences, as a baclk man, on the issue of drugs and addiction. Like addiction and so many things that white manipulate, 'not my problem. I take drug and addiction for example. While my counterpart may run rampart through streets on drugs and behaving addictively, if you believed the lies and government and newspaper articles that black men are drug addicts and drug dealers. I said black folks have jumped on banned wagon by pscyhologiclly negating black men. Which explains the house negroes and the white people were running around lieing about me. DEPRESSION vs OPPRESSION. White folks will create industries to rationalize their racism. I told my neice 'you can not believe what white folks, the government which include house negros say about black men. It is an industry. And industry that pawns black men. Whenever a white person, a government agent which include house negros speak about men of color ... it is always connected to lies.